In the past, choosing between laminate flooring and wood flooring is quite an easy decision. Wood flooring was the only way to go if you really wanted the best look and quality. Laminate flooring was only chosen if you could not afford real hardwood. It looked nothing like real hardwood, and often developed waves and peaks. However, the decision is no longer as black-and-white now, thanks to the modern technologies. While wood flooring is still considered as a premium option, laminate flooring is now performing better than ever before. Laminate flooring is now a contemporary, cost-efficient option that many people prefer. 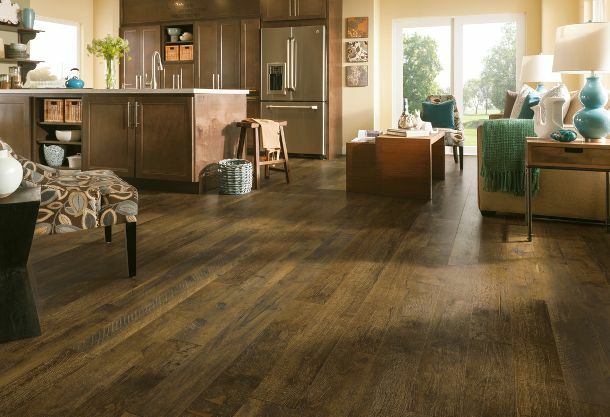 So, should you choose laminate or wood flooring? Below, we will see how laminate flooring and wood flooring compare against each other. 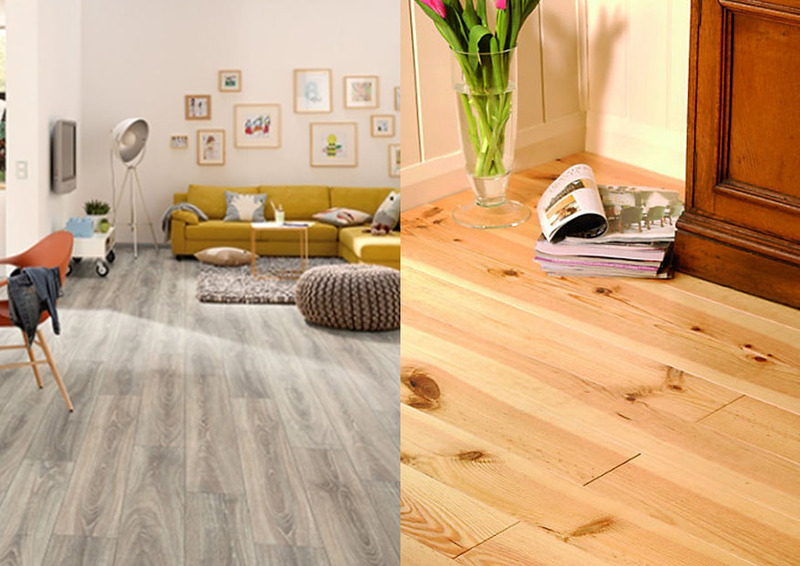 By the differences, you will be able to determine whether laminate flooring or wood flooring will suit your home best. Continue reading now! 1 What is Wood Flooring? 2 What is Laminate Flooring? Laminate flooring, sometimes also called floating wood tile across the United States, is a type of multi-layer synthetic flooring whose layers are fused together by a lamination process. Often, laminate flooring simulates the appearance of wood or stone by inserting a photographic applique layer under a clear protective layer. Meanwhile, the inner core is composed of melamine resin or fiber board. Today’s laminate flooring has decent quality and durability. Some brands even contains an antimicrobial resin to make their floors hygienic. 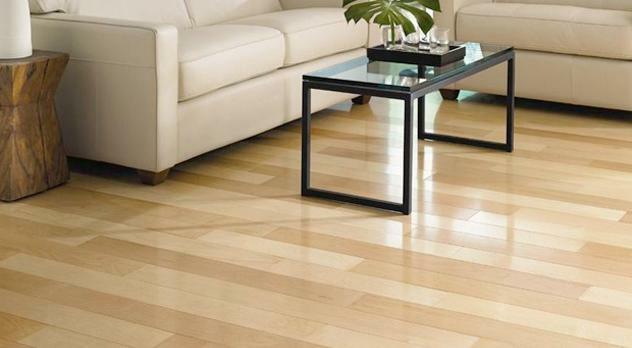 Laminate flooring and wood flooring are different that they are made using different materials and processing methods. Laminate flooring is basically a thin fiber board that is topped with an image of wood or stone and a transparent wear layer. All the layers are bound together through a lamination process. It may contain an antimicrobial resin, depending on the brand. On the other hand, solid hardwood flooring is 100% wood. Meanwhile, engineered wood flooring would have a plywood base. The processing may involve cutting and pressing. A good quality laminate floor nowadays can look very much like real wood from a distance. Higher quality laminate floors also have less pattern repetition, making them appear more like the real thing. However, solid hardwood flooring, even the cheaper species, can look more attractive than premium laminates. Laminate flooring is often preferred because of the affordability. Decent quality laminate flooring can be acquired for about $3.00 per square foot. It is also very easy to install; you can even install it by yourself. Most laminate flooring products are designed to snap together so that you won’t have to glue. Then again, you can use glue to keep the planks immobile, or use the planks in a floating installation. However, cheap laminate flooring doesn’t have much of a resale value. Premium laminate flooring usually gives a moderate resale value. On the other hand, wood flooring is always more expensive than laminate flooring. The price may vary especially by the type of wood. Low-end oak, maple, and ash solid hardwood start from about $3.00 per square foot or higher, whereas exotic species may go for at least $5.00 per square foot. Well-maintained wood flooring gives a considerably higher resale value, but less desirable species like red oak may give a lower resale value than premium laminate flooring. Hardwood flooring is very difficult to install by non-professionals; special tools like a floor stapler and others are needed. Laminate flooring can last up to ten years. Water infiltration, scratches, and ultraviolet rays may reduce the lifetime. Laminate flooring cannot be sanded or refinished. So, when it is scratched or damaged, replacement is the only cure. It can endure impacts to a certain degree; a heavy impact can gouge it down to the fiber board base. On the other hand, wood flooring can last for a life time if properly maintained. Even so, a flood can render it completely worthless, and ultraviolet light may cause discoloration. Nevertheless, wood flooring can be sanded and refinished multiple times. You can simply sand or refinish if it is scratched or damaged. The impact resistance is incredible. Laminate flooring is a good choice if you have a pet in your home. The wear layer will protect the flooring against claws and prevent it from collecting fur and filth. Make sure to clean it regularly so that it won’t build up static. On the other hand, wood flooring is perhaps not the best choice for pets because wood can be scratched by the claws and collect fur and filth. Also, sometimes wood may contract or shrink, creating gaps between the planks. Laminate flooring can be installed in a moist environment, such as a lightly used bathroom, as long as you seal it properly. It can be used for the basement and over a radiant heating system. Meanwhile, wood flooring is not recommended for any moist environment, basement, or over a radiant heating system. Seeing the qualities of today’s laminate and wood flooring, we can conclude that wood flooring is a great choice only if you want to get the best resale value or if you want a floor that can last for a lifetime without special considerations. However, if you are looking for an option that is simple, cost-efficient, and easy to maintain, laminate flooring is the way to go.